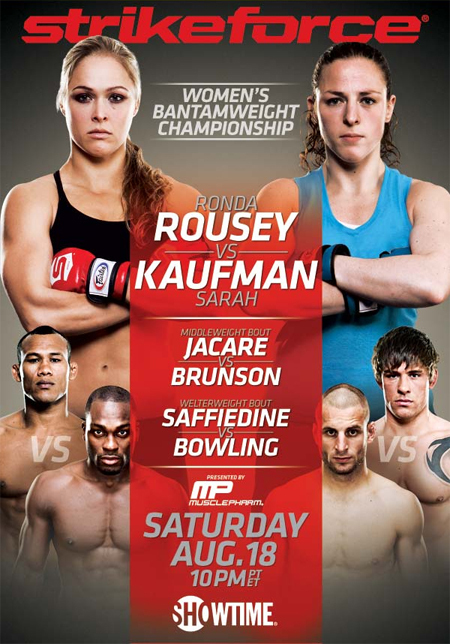 “Strikeforce: Rousey vs. Kaufman” took place Saturday inside Valley View Casino Center in San Diego, California. Bantamweight queen Ronda Rousey broke in her freshly-minted title against Sarah Kaufman in the show’s featured attraction. Middleweights Ronaldo “Jacare” Souza and Derek Brunson served as the co-main event. 1stRound: Both Green and Ricehouse swap hard leg kicks. Nice right-left combo by Green, followed by a solid knee. Ricehouse eats another knee to the face. Green drops Ricehouse with a right and begins to smell the blood, but can’t finish. Green gets a takedown right into side control, Ricehouse gets back up as the round ends. Green, 10-9. 2ndRound: Green grabs the back of Ricehouse’s neck and lands more knees. Ricehouse throws a knee to the body and follows with a straight right. Solid jabs are bouncing off Ricehouse’s face. Green gets the takedown, though can’t capitalize. Green, 10-9. 3rdRound: Ricehouse continues to circle the cage, as Green stalks him down. The fighters exchange strikes with Ricehouse finally landing a two punch combo. Nothing to write home about in the final stanza. Green, 10-910-9 Green. 1stRound: De Randamie misses on a huge overhand right that gets the crowd grumbling. Yamanaka lands a straight left. Straight right clips the jaw of Yamanaka, who shrugs off the punch. Another de Randamie right connects before the women clinch against the cage. De Randamie, 10-9. 2ndRound: Yamanaka is working hard for the takedown, but de Randamie isn’t cooperating. Nice combination lands for de Randamie, Yamanaka is still doing a good job of avoiding getting her head taken off by the big overhand right. De Randamie, 10-9. 3rdRound: Left hook and right finds a home on Yamanaka’s face. De Randamie continues to look for the knockout punch. De Randamie takes a knee to the groin which causes a brief break. A slobberknocker ensues when the fight resumes, neither contestant scores anything significant. Yamanaka is proving she can take a punch, as she barely avoids a right headkick. De Randamie lands a front kick to end the bout. De Randamie, 10-9. 1stRound: Amagov lands a spinning back kick and follows it up with a push kick to Berry’s lead leg. Amagov begins to ground and pound as referee Herb Dean steps in to stop the bout believing Berry was done. Dean appeared to pull a quick trigger on that stoppage. 1stRound: The ladies are swinging for the fences early. Kedzie clocks her with a front kick to the grill and is clobbering her with punches. Tate appears to have recovered. Tate has her clinched against the cage trying for a takedown. Kedzie reverses and tags her with a short elbow to the face. Kedzie stuffs a takedown and nails her a few times in the dome. Tate goes for another telegraphed shot. Tate connects on an overhand right. Kedzie drops her with a side kick. When she dove in for the kill, Tate catches her in a triangle armbar but she’s out of time. Kedzie, 10-9. 2ndRound: Kedzie has her clinched against the fence. Tate tries a hip toss, but Kedzie ends up in top position. Kedzie transitions for an armbar, but Tate immediate tries to counter with a knee bar. Tate moves to his back and slaps on a rear-naked choke. Tate is now in full mount. Tate now gets a guillotine choke, but can’t finish off her gritty opponent. Tate, 10-9. 3rdRound: Kedzie takes her leg out from under her with a kick. Tate appears hurt. Kedzie drops her with a head kick and pounces. Tate now tries an armbar from off her back. Tate finally gets Kedzie’s arm extended. Kedzie was holding on for as long as she could, but was ultimately forced to cry uncle. Great scrap. 1stRound: Cook connects on a powerful leg kick and St. Preux responds with a head kick. St. Preux floors him with a left hook and is bringing the pain on the ground. The referee was close to stopping the shootout, but thankfully didn’t because Cook comes firing back and rocks St. Preux. Thrilling back-and-forth action. St. Preux gets him to the canvas. Cook fights to his feet. St. Preux, 10-9. 2ndRound: St. Preux clocks him with another head kick. The pace has definitely slowed. Cook takes a kick to the groin and time is called. Game on. St. Preux tires another head kick, but Cook connects with a counter right hand. St. Preux successfully gets a takedown. He advances to full mount and is giving him the business. St. Preux, 10-9. 3rdRound: St. Preux clobbers him with a nasty left. LIGHTS OUT. 1stRound: Smith immediately plants him on his back and advances to full mount. Sayers fights his way to his feet and eats an elbow as they separate. Smith falls to his back and slaps on a triangle choke. Sayers is forced to call it quits. 1stRound: Bowling scores with some body shots. Saffiedine clobbers him with a knee to the midsection in the clinch. Bowling willing to eat knees in his efforts to secure a takedown. Unfortunately for him, his efforts are for naught. Close round to score. Saffiedine, 10-9. 2ndRound: Bowling takes an accidental poke to the eye and time is called. The doctor gives him the ok to continue. Bowling tags him with a one-two combo. Saffiedine has him clinched against the cage, Bowling reverses and tries a takedown. Another tight stanza to score. Saffiedine, 10-9. 1stRound: Jacare floors him with a right hook. The Brazilian continues his assault on the canvas. Brunson eats another flurry. It’s a wrap. 1stRound: Rousey comes out swinging and has her clinched against the cage. Rousey gets the scrap to the mat in less than 30 seconds and immediately slaps on an armbar. Kaufman tries to fight her off, but… Game. Set. Match, Rousey. Rousey just called out Cristiane “Cyborg” Santos. Wants the suspended fighter to drop to 135 to meet her.